March 18, 2010 by andrea | Filed under Asian, Main Dish, Pork, Quick Cooking, Recipes. I could eat stir-fries just about every day. It’s a great way to make a quick meal plus there’s a bazillion different ways to make them, which means you never get bored with the same ol’ thing. 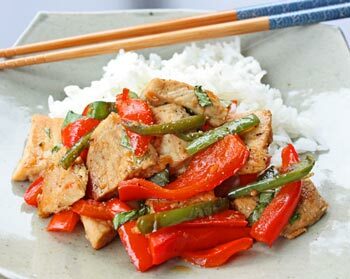 Here’s a recipe I found recently that features stir-fried strips of pork with thinly sliced sweet red pepper and spicy jalepeno chiles. I used boneless pork loin chops (they were on sale) instead of the pork tenderloin, which worked fine but the tenderloin would’ve been more tender. Thinly sliced chicken breast would be a good substitute for the pork, if you prefer. Serve with steamed jasmine rice. Pork tenderloin is the ideal cut for stir-frying because of its tender texture and meaty flavor. Serves 4. Whisk soy sauce, fish sauce, lime juice, and sugar in bowl until sugar dissolves. Pat pork dry with paper towels and season with salt and pepper. Heat 2 teaspoons oil in large nonstick skilled over medium-high heat until just smoking. Brown half of pork, 1 to 2 minutes per side. Transfer to bowl and repeat with additional 2 teaspoons oil and remaining pork. Add bell pepper, jalapenos, and remaining oil to empty pan and cook until just softened, about 3 minutes. Add garlic and 1/2 teaspoon pepper and cook until fragrant, about 30 seconds. Return pork and any accumulated juices to pan. Stir in soy sauce mixture and cook until slightly thickened, about 1 minute. Off heat, stir in basil. Serve. Test Kitchen Note: To make the pork easier to slice, freeze the tenderloin for 15 minutes until slightly firm.